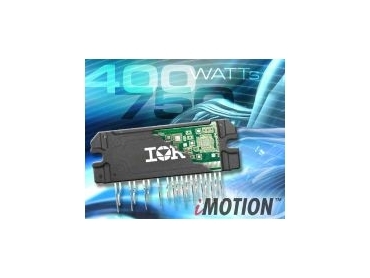 INTERNATIONAL Rectifier has expanded its iMOTION range with three new advanced integrated power modules (IPMs). The new IPMs simplify variable-speed electronic motor control circuits commonly found in today's energy-efficient appliances. They feature a three-phase inverter power stage with gate drivers and auxiliary circuitry in a compact, high-performance, isolated package. All three new devices combine low loss, non-punch-through (NPT) short circuit-rated IGBT with a three-phase, high-voltage, high-speed driver IC and over 20 individual parts into a single unit. The new modules, plus a few external components and one microcontroller, enable a complete variable speed motor drive. EMI emissions are minimised due to shorter connection routing, optimised component layout and internal shielding. The 6A-rated IRAMS06UP60A and IRAMS06UP60B are designed for motor drive applications in appliances and light industrial products. Examples include compressors in refrigerators or fan controllers in heating and ventilation systems up to 400W. The IRAM06UP60A has open emitter configuration, enabling multi-shunt current feedback for sophisticated vector control loops. The IRAMS10UP60B includes a current feedback shunt, designed for appliances such as air conditioners and energy-efficient washers up to 750W. It is pin-to-pin compatible with the existing IRAMS10UP60A and IRAMX16UP60A, giving the motion control designer a simple path to upgrade or expand power level offerings in existing designs. The IRAMS06UP60B is the best choice for simplified V/Hz control type motor drivers, with no circuit layout limitations. Built-in over-temperature and over-current protection and integrated under-voltage lockout functions deliver fail-safe operation. Bootstrap diodes in the high-side driver section combine with the required single-polarity power supply to simplify circuits. In addition, all new IPMs include a temperature monitor read-back signal and synchronised shut-down function.